City in Portugal that had, next to Santarem, the oldest Jewish community in Portugal. In a foro (charter) granted to the city of Beja toward the end of the twelfth century, it was enacted that every Jew passing through the town should pay a toll of one maravedi (about one-fourth of a cent). 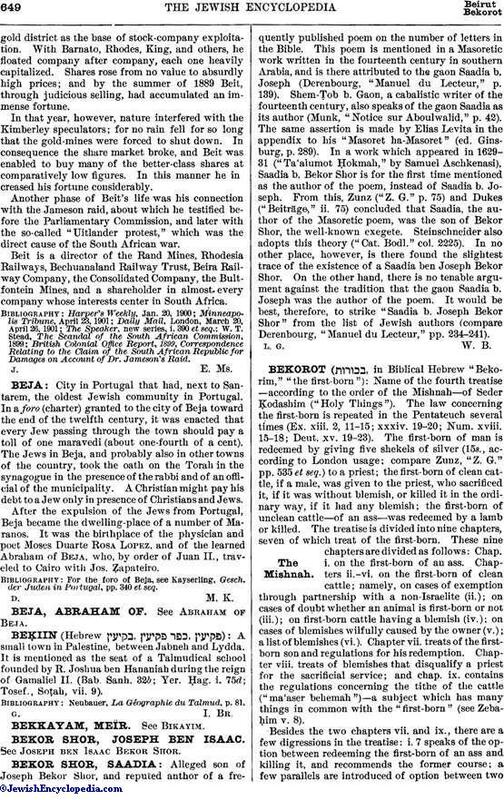 The Jews in Beja, and probably also in other towns of the country, took the oath on the Torah in the synagogue in the presence of the rabbi and of an official of the municipality. A Christian might pay his debt to a Jew only in presence of Christians and Jews. After the expulsion of the Jews from Portugal, Beja became the dwelling-place of a number of Maranos. It was the birthplace of the physician and poet Moses Duarte Rosa Lopez, and of the learned Abraham of Beja, who, by order of Juan II., traveled to Cairo with Jos. Ẓapateiro. For the foro of Beja, see Kayserling, Gesch. der Juden in Portugal, pp. 340 et seq.